Westfield in Bloom: Thank You Star Painting! 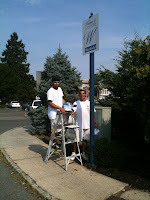 Moses and Marcos of Star Painting re-painted the chipped and faded Westfield Signs around town. The poles that held the Downtown Westfield signs were in serious need of a new coat of paint. The signs look great, thank you! Greenup, Greenup, Everybody Do Your Share! Star Painting is at it Again! Westfield is in Full Bloom!